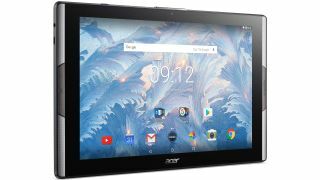 Tablets can live or die by their media abilities, and the upcoming Acer Iconia Tab 10 isn’t going to go down without a fight, as it’s one of very few slates with a Quantum Dot display. That’s a technology that’s been dabbled with a bit on tablets, such as the Kindle Fire HDX 7 and HDX 8.9, but not yet hit the mainstream, and that’s a shame, as it has the potential to deliver brighter, more vivid images than standard LCD displays, with more accurate colors and more efficiency, so your battery lasts longer. That could make the screen on the Iconia Tab 10 a cut above the competition, although right now we don’t even know what resolution it is, let alone what it looks like in the flesh, so we’ll reserve judgement. But it’s not just the screen on the Acer Iconia Tab 10 that could be set to impress, as the slate also comes with an Acer-patented subwoofer and four speakers, for punchy, rich and immersive audio. The company has also announced the Acer Iconia One 10, which lacks the Quantum Dot display and wealth of speakers, but packs in two micro USB ports, so you can charge it at the same time as connecting it to an external device, such as a mouse or hard drive. Most of the specs of these two slates are yet to be revealed, but Acer has said that they’re both powered by quad-core MediaTek chipsets, which suggests they will be low to mid-range, rather than high-end. They also both run Android 7 Nougat, offer up to 8 hours of battery life, support gesture controls and apparently have wide-viewing-angles. Both the Iconia Tab 10 and Iconia One 10 are set to launch in the UK in October, but availability elsewhere and pricing is yet to be confirmed.